Especially designed to get around those hard to reach places that standard screwdrivers are too tall and awkward to maneuver at your machine. Comes in an attractive zippered case for easy storage and travel. 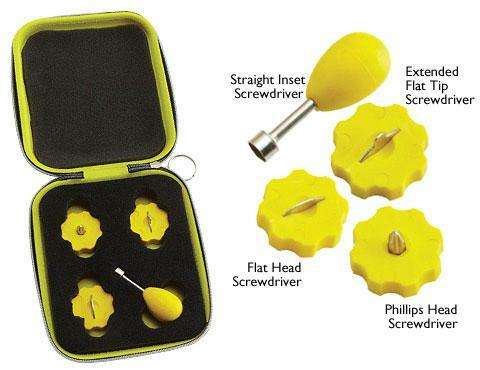 Kit includes: A screwdriver with a bulbshaped handle and tubular guide for removing and inserting the needle screw or presser foot screw. A flat head screwdriver that easily removes flush mount screws often found on the needle plate. An extended flat tip screwdriver that easily removes countersunk screws found on some needle plates. A Phillips head screwdriver designed to maneuver hard to reach areas. This item is subject to a Minimum Advertised Pricing Policy 29.99. Full Brewer MAP policy details are available for review on our website, under the Shop Resource tab.